This necklace looks great on both men and women. 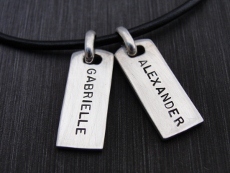 The sterling silver rectangle necklace is hand stamped and personalized with a name or affirmation. 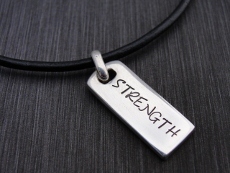 It comes in a high polish or brushed sterling silver 14 gauge rectangle tag that measures 22mm x 9mm and accommodates 9 script characters and 10 block characters,. he tags hang on 16, 18, 20", 24" 1.5mm ball chains. For men we have 18", 20", 22", 24" and 30" 2.5mm ball chains. Brown or Black leather cords come in 18", 20", 22", 24" and 30". The tags can be stamped on front and back. To order this item, please select a style, chain length, font style, finish, enter name(s) (one per rectangle), then click the Add to Shopping Cart button.